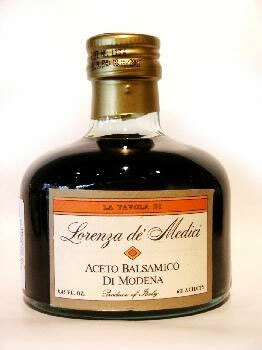 Lorenza De Medici Aceto Balsamico of Modena is presented by the Tuscan expert, Lorenza de Medici. Lorenza's balsamic is a robust, aromatic balsamic condiment, which can hold its own with big fruity olive oils without losing its richly sweet-tart influence. Its acidic finish makes this balsamic a favorite for grilled, roasted or broiled meats & seafood. Lorenza De Medici Balsamic Vinegar.